With nearly twenty years of stories behind him, Mike Mignola's Hellboy is still moving forward with a voracious appetite, investigating the supernatural issues no one else dares to touch. On this adventure, though, he very well may have bitten off more than he can chew. That's no hyperbole either, as the scale and stakes have never been higher, both for Hellboy and the planet itself. Staring down the Queen of Witches, Hellboy's aim is nothing short of circumventing the end of civilization as we know it. An extinction event on par with the fall of the dinosaurs is nearly upon us, and the only thing standing between it and us is the little red demon with a giant, gloved right hand. This penultimate chapter for both mini-series and character is heavy on the atmosphere but still exceptionally easy to read. Mike Mignola's writing has come a long way since he teamed with John Byrne back in Hellboy's very first adventure, and the way he calmly lets major events play out without an excess of narration or explanation is just further proof of his graduation from writer-artist to genuine storyteller. It's an extremely well-crafted issue that efficiently covers the full gamut of emotions, then leaves its audience wide-eyed and uncertain about where things can possibly go next. While he may not be providing the artwork any longer, Mignola's writing is still masterfully streamlined and simple, and he trusts his companion implicitly enough to leave the majority of the storytelling to the visuals. Of course, the real question for any artist who dares to take up the mantle on Hellboy is how their work compares to Mignola's original run with the character. And while no less than a dozen different artists have offered their take on his signature creation, none have stuck around nearly as long as Duncan Fegredo. 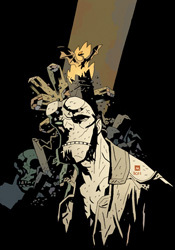 Since his first run with the series in 2007's Darkness Calls, Fegredo has carved a spot for himself in the Hellboy mythos, and with good reason - his style is an extremely close approximation of Mignola's. Truth be told, aside from their differing takes on common human characters, it's difficult to distinguish the two at all, particularly when it comes to the titular character. Fegredo's work gets lots of room to stretch its legs this month, with a gigantic fight scene spanning most of the issue and macabre gothic accents enlivening the backgrounds, and he responds in fantastic form. It's a genuinely gorgeous issue that takes on a wide variety of emotions, implications and premonitions, while still maintaining that eerie sense of haunted reality that Mignola has always brought to the table. The big man himself couldn't have done it any better. It's a rarity in the comics world, or truly in any form of entertainment, for promises of "this changes everything" to truly deliver. Either editorial interference, reluctance on the part of the creators or desperate, poorly concocted new directions hamper such examples with very few exceptions. Not so with Hellboy: The Fury. It's a concluding chapter worth remembering, a storytelling decision born not of any perceived need to shake things up. It's the natural progression of a yarn that's been spinning for some time, and an especially effective one at that. Buy it.